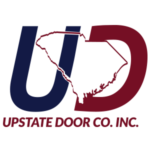 Upstate Door Company is a full-service commercial and industrial door parts, service, and installation company. First, we provide the highest quality products for new installation for you to select from. From specialty doors, overhead doors, roll-up service doors, fire doors, high-speed doors, shutters and curtains, to sectional overhead doors and more, we can meet any door need your company has. Next, we know that components on commercial doors can wear out, so we work on thorough inspection and replacement of worn parts regularly throughout their use. We know the small areas that can turn into large problems on a door system. Things like cables that fray, or rollers that become worn. we're going to do the inspection of the cables, the rollers, the counter bar systems, including lubrication and replacement of any necessary parts. On the rolling service door, we're going to check the operating mechanism, and electric operators that encompass the safety equipment such as the reversing edge, or the photo eyes. We focus on maintenance of these parts to make the life of your door last as long as possible. If you have a door that isn’t closing properly, or you need to upgrade an full office building to maintain American Disabilities Act (ADA) requirements, Upstate Door Company will offer you options to exceed your expectations. We also help you with fire door drop tests that are required annually. When you work with us, you work with a company that is dedicated to service and fulfilling your unique needs. We aren’t a one time sale. We form lasting partnerships with customers to make sure you receive long-term solutions to your commercial and industrial door and service needs.